I love seafood soups, the clear soups more than the chowders in fact. All Japanese, Chinese, korean style soups are great for me provided they have a rich broth used for the tidbits added to the broth. The seafood soups I make at home are always a rich broth mainly and the add on tidbits have a mind of their own. I mean I like a robust broth and the vegetable and sea food tidbits in the soup should be cooked briefly in the broth so they don't loose their own distinct identity. So a rich seafood broth and some fresh crunchy vegetables, some bits of shrimps, may be some crab meat, some fish balls or calamari rings complete a nice seafood soup for me. But, I usually make them with just shrimps or prawns because they are easily available all the time. I add Bok choy, spring onions, shreds of cabbage, broccoli etc to my seafood soups but mushrooms are a must. I add them a lot in my soups anyway. The secret (actually not such a secret) to a good non vegetarian soup is a good broth. Although I like all my vegetable soups without any base stock to get cleaner flavours. Broth is used more to get the health benefits of gelatin or glucosamine, you would love the taste if you like seafood, keep the flavours clean by adding just a spring onion and may be some roots of coriander to the stock. You wont need much to be added to the soup if you use just these two. Seafood broth is the easiest thing to cook. I normally save all the shells of the shrimps or prawns and the head and tail of the fish I buy. These can be frozen for later use, nicely labeled so you can make a broth when required. Freezing the prepared broth takes up more space so I prefer freezing the shells and bones etc. To make a perfect broth to my taste, I just pressure cook the prawn shells and/or fish head and tail in water, a couple of spring onions and a couple of cabbage leaves or coriander roots. If you cook them in a pan you have to cook them for quite a long time so all the Glucosamine is released from the chitinous seafood shells or bones. 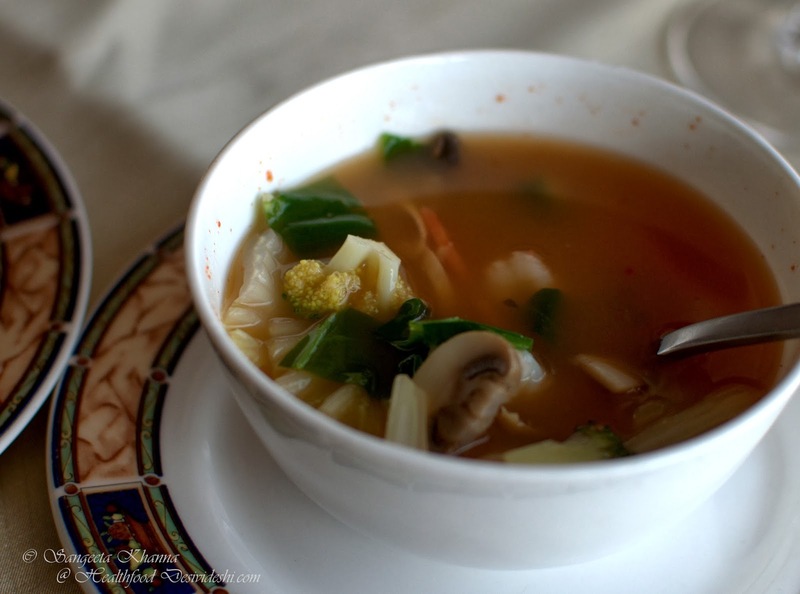 A broth cooked this way is a great supplement for joints and cartilage tissue. The more extraction of glucosamine into the broth while cooking, the more thick it gets when cooled. The broth gets jelly like when cold, the same happens when gelatin is extracted by chicken, mutton or beef bones. This imparts a rich and robust taste to the broth as well and supports all fresh ingredients put into the soup later. Just add fresh vegetables and cleaned shrimps or any seafood you like, to the boiling broth, add some wakame or some leafy greens you like, some broccoli or cabbage, some mushrooms or lots of them and whatever vegetables you love. Some sesame oil makes it for me to bring up flavors, bit of garlic and loads of garlic chives or spring onions. Just go by whatever you like for that moment, sometimes a crisp tadka of south India works really well. Try rasam powder in the soup and see. Or season with miso, hot pepper sauce or soy sauce and a good soup is ready to nourish your soul. 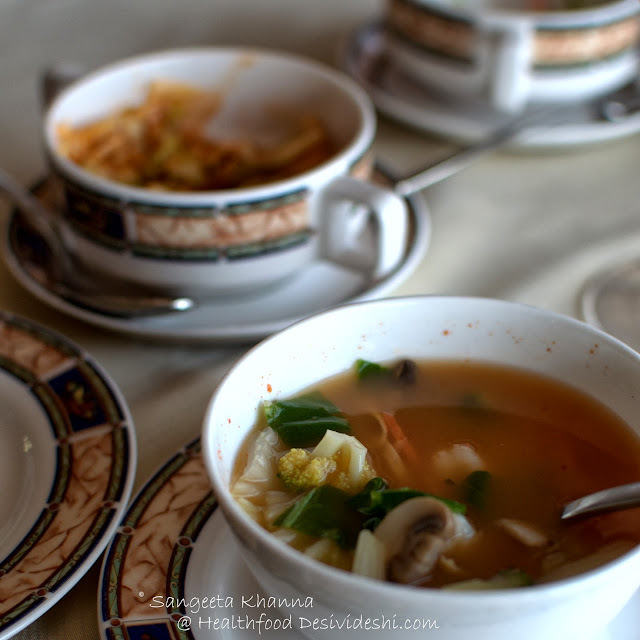 This seafood soup I had recently at Le Belvedere, located at the 20th floor of Le Meridien. They are hosting a seafood festival right now and the fare I tasted was just awesome. This soup was loved with all the fresh vegetables, the broth was not as rich as many people do not like fishy smell in their food in Delhi so I understand how the hotels accommodate. This soup was Chinese suited for a north Indian palate I would say. But great flavors I must add. 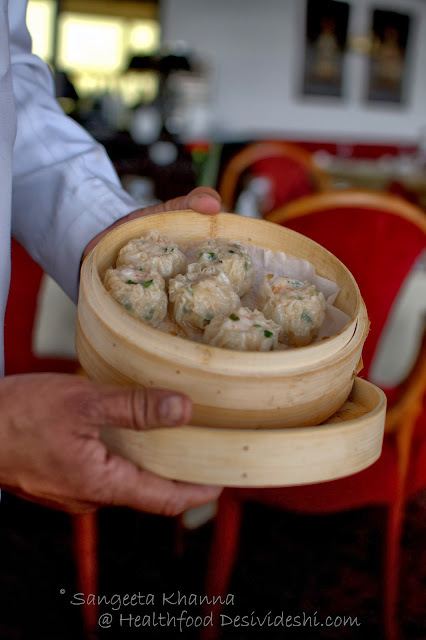 This prawn siu mai was as good as I had it last time at Le Belvedere, it will definitely be on my menu whenever I go there. Succulent and fresh to sum it up. 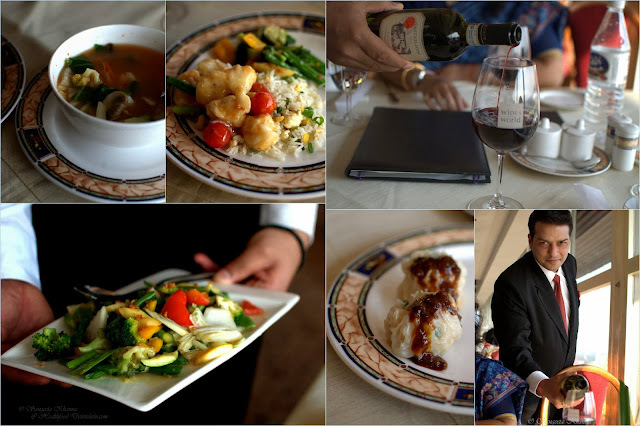 The lunch with a glass of Chianti was an absolute delight and yet light on the stomach. I almost finished the platter of stir fry mixed vegetables, so crunchy and fresh, mildly seasoned, just the way I like. The gorgeous Lobster in basil and red jalapenos was absolutely yummy. 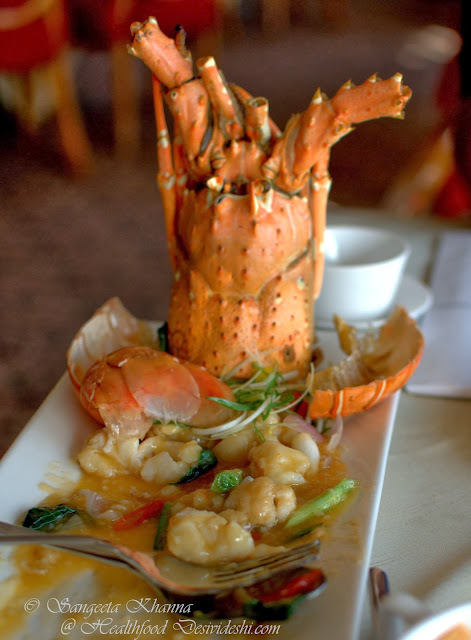 Meaty succulent lobster meat and fresh spring onion with a mild basil and jalapeno flavored smooth sauce. I will be cooking it really soon, loved it so much. 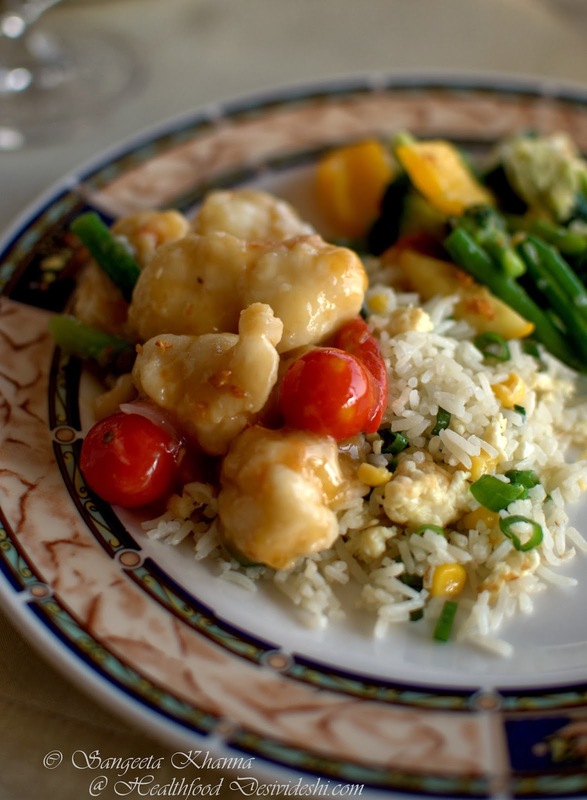 It was all devoured with a nice garlic eggs fried rice which was a good accompaniment to the saucy lobster meat. I can't actually decide what was better but we ate so much that we decided to skip dessert. 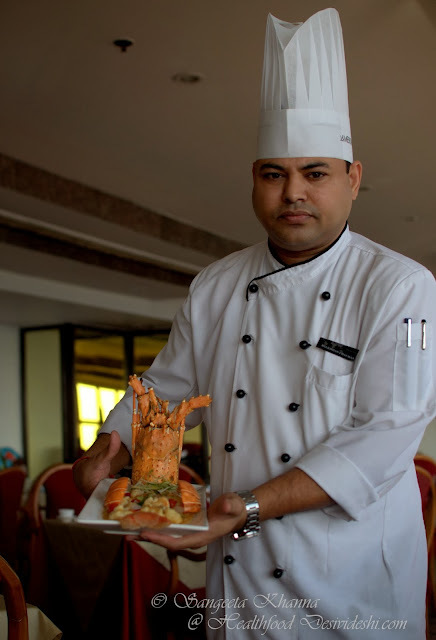 It was all prepared in the guidance of Chef Balkishan Chauhan, who was awarded by Indian Culinary Forum for being the best Oriental cuisine masterchef last year. He is a gentle person who helps you choose the best suited meal for you if he is around. He has a good team of well behaved wait staff at Le Belvedere. 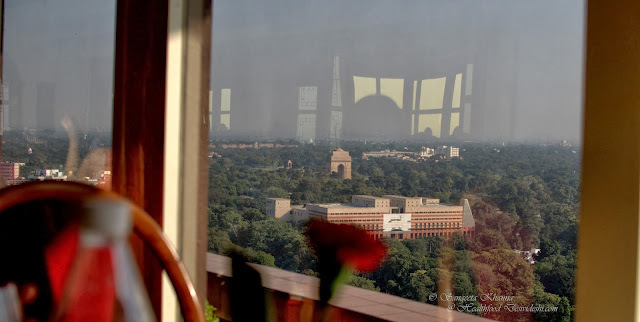 The ambiance of the place is enhanced by the presence of wall to wall windows that overlook the best parts of Lutyens' Delhi. India gate looks like a trophy showcased in the drawing room from the windows of Le Belvedere. Can you beat that? I wish the interiors were a bit livelier at this place though. A place so high, with such a beautiful view should have more appealing interiors I feel. ways to make the best seafood soups and a lovely seafood meal at Le Belvedere, Le Meridien..
am not a seafood person (you know that) but i could go to this place just for the views! !